Righthander Leban, a Mudcat in both 2015 and '16 was selected out of the University of Kansas by the Miami Marlins in the 12th round. Among the 2016 teammates was Stuka, a tall righty from California-San Diego. He was selected in the 39th round by the Baltimore Orioles. in the MLB draft or otherwise signed to pro pacts. Caleb Bounds, the Savannah High School graduate and former North Central Missouri College pitcher whose four wins in each of his three summers with the team from 2014-16 make him the Mudcats’ career leader in winning decisions with 12, has been hired by the team’s board of directors to build and lead the 2019 squad. “We are excited to have Caleb back for the 2019 season” Doug Doughty, team general manager, said in announcing that Caleb will return. Welcome to the site of the Chillicothe Mudcats. 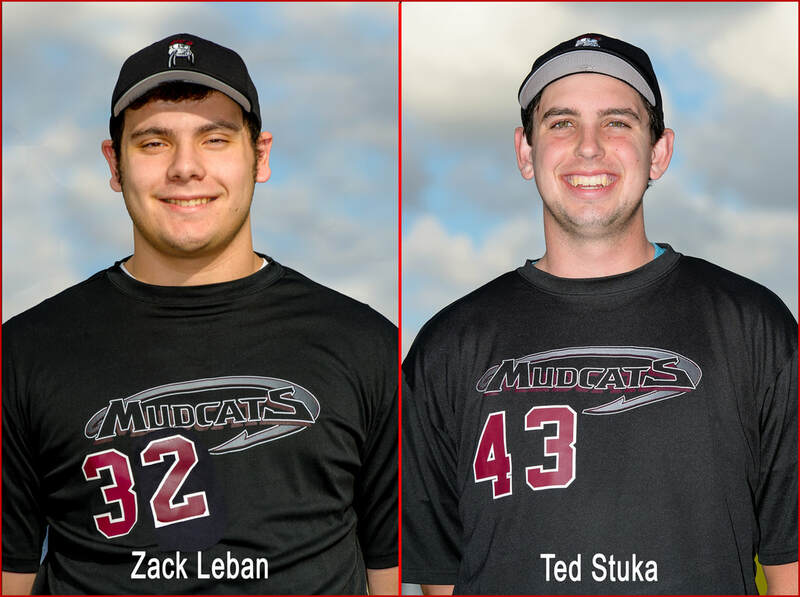 The 2018 season will mark the seventeenth season of Mudcat baseball. 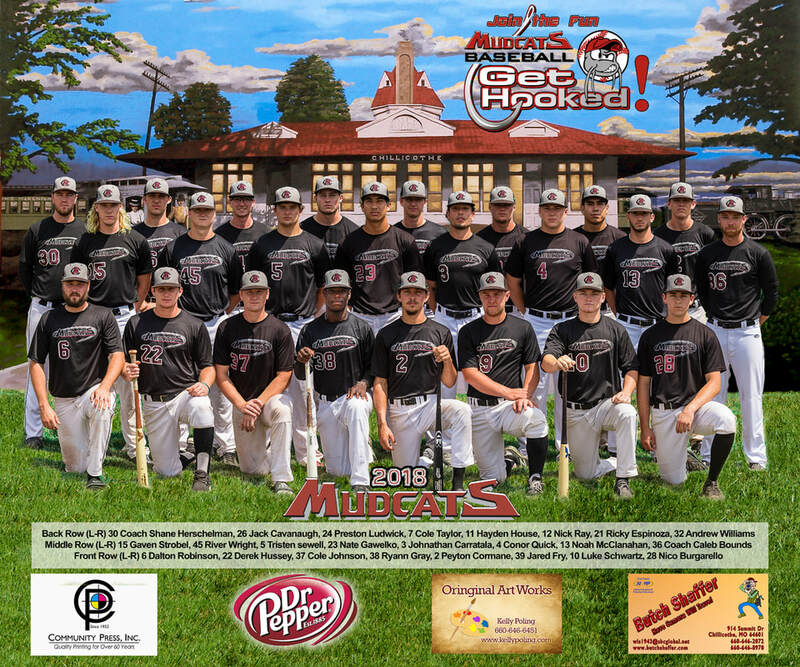 The Mudcats participate in the MINK League (a wood bat league). The MINK League is made up of teams from Missouri, Iowa, Nebraska, and Kansas. During the sixteen years the Mudcats have always had a winning record. The Mudcats organization is run by Grand River Entertainment of Chillicothe. GRE is a non-profit organization whose primary purpose is to bring family type entertainment to the area. The Mudcats have been very successful and the community has been very supportive of the team. Players from the Chillicothe Mudcats spent Thursday morning volunteering at Community Outreach. Here, they are packing bags of food to be distributed through Community Outreach of Nevada. Pictured are, from left: Chris Cabral, Josh Urps, Tyler Hansen, Bryce Bisenius, Tanner Baker and Kody Gardner. Congratulations to Ramger Iglesias, Bloomfield College, Named by Baseball America "Summer College League Top Prospect"
Four former Chillicothe Mudcats were drafted in this year’s MLB draft. Shown here in their Mudcat uniforms (9) Todd Czinge to the Rockies in the 29th round, (13) Garrison Schwartz to the Braves in the 16th round, (31) Riley Echols to the Indians in the 24th round and (40) Blake Weiman to the Pirates in the 8th round. Congratulations to these young men! Everything happens for a reason! Austin Kerns, a native of Owasso, Oklahoma, was 12 hours into his 25 hour drive to New Hampshire for summer ball when he got the call. Austin went home and signed with the Astros. Austin played with the Mudcats in the summer of 2014. Another Mudcat, Sean Rackeski, Signs With MLB. Caleb Joseph talks to Paul Sturm about being in the Majors. Click play button to listen. The Chillicothe Mudcats have reached an agreement which will allow the Mudcats to workout at the Grand River Area YMCA. The facility will be available to the Mudcats all summer for free. Click on the team logo to access their website.